Stressed about what to do for a Birthday Party? 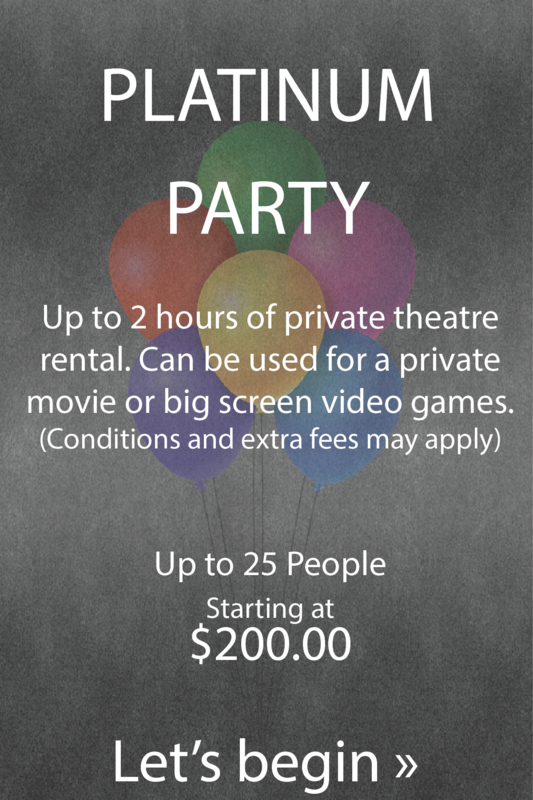 Consider bringing your celebration to the Movie Mill! We feature an indoor 9-hole miniature golf course, two (2) party room (seating at tables for 14, with room around the perimeter), and seven (7) full feature movie theatres with your choice of current films and show times. Are your guests going to be hungry? We offer Little Caesars Pizza, jugs of pop, hot dogs, and concession munchies. Sound like fun? Everyone has a blast with Movie Mill parties! How do I get started? Is there anything I should know beforehand? We have two (2) Party Rooms available (seating at a table capacity for 14 children, with room for parents around the perimeter). A deposit is required to book these rooms. Outside of a package, they each rent for $30 for 45 minutes. Outside food, beyond a birthday cake, is not allowed. Your movie will be enjoyed at regular showtimes with the general public. If you desire to book the entire theatre for your group, please visit our theatre rentals page for more information. Movie choices will be confirmed by the Tuesday before your party. We generally always have family-friendly movies available. You are encouraged to book as far in advance as possible to ensure that space is available.